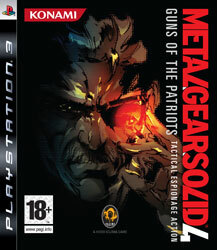 It’s hard to believe that after so much hype, so many trailers, so many years in development, Metal Gear Solid 4 actually came out last summer. It always seemed destined to be one of those epochal games, assuming it could live up to that astronomical hype, and it really did. I had my doubts that it could come anywhere close to tying up all those loose ends that the last two games in particular had left, and while it had to utilise some insanely long cut-scenes to do it, I put it back on the shelf at the end more satisfied than I had any right to be after finishing a game with such a labyrinthine story. Some didn’t like playing a game that you could spend up to an hour not actually playing, but if you came away from the game with that as a complaint you apparently hadn’t played a Metal Gear game before. That’s not to say that MGS4 was more of the same, because it deserves credit for being a game that wasn’t afraid to change what had always been a highly successful formula. While so many Japanese developers are struggling to make the jump to the current generation – can we stop calling it ‘next-gen’ yet? – Kojima and his team modernised what had been a bit of a dinosaur in terms of controls and movement in 3D space. Where MGS3 required three hands to perform some of the more complex techniques, this one actually felt like a proper, modern game, able to work just as well as an action game as it was the standard stealth fare. I did have issues with it, the main one being that aside from the endgame, it peaked with the phenomenal first two acts, but overall the fact that this game even met my expectations was an achievement. That it exceeded them is testament to how big an achievement that was.